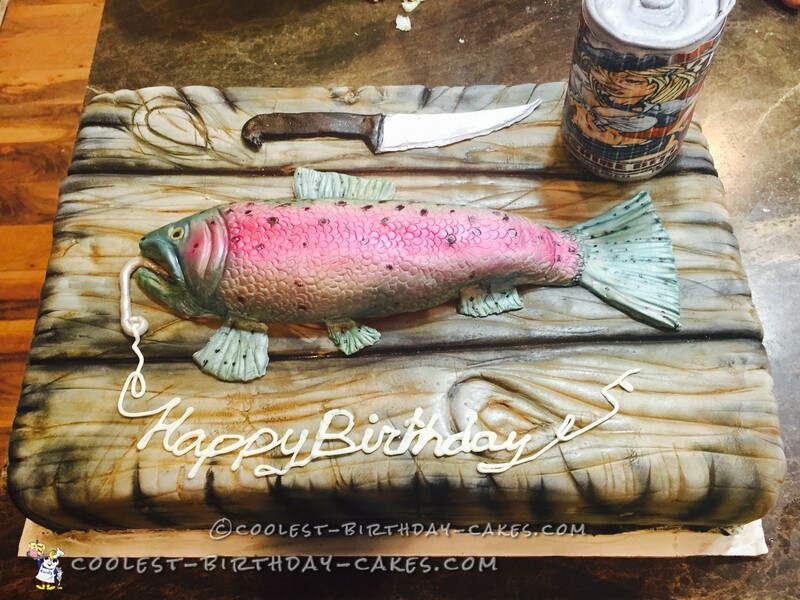 This rainbow trout cake was made for my husband’s 40th birthday this past week. The fish and beer can are made out of Rice Krispie treats, covered in fondant. The fish was covered in a green grey fondant. I then added in the lines and such from looking at a picture of a real rainbow trout I had sitting in front of me. After getting all the lines and scales on, I used different colors of luster dust to create the rainbow trout features such as the pink line and black freckles. The can I made by covering in grey fondant, printing off an image of a beer label and using it as a wrap around the fondant. The board was covered in a marbled effect pipe/grey fondant. I used a clay tool to make the lines and then used my airbrush to brush on different shades of brown and some black to give it a “rustic aged” look. The knife is made out of fondant. Everything on this cake is edible. The wood grain is my absolute favorite texture to do, however, I now have a love of using all the different luster dusts to create beautiful colorful fish. I loved every aspect of making this cake! A lot of people had a hard time believing this was actually a cake. Birthday cake idea Posted by Kayla W.